Nowadays, the residential properties are increasing in important cities of India which aims at catering the needs of people. A lot of villas, apartments, and luxurious homes these days built with more floors to ensure a better accommodation. On the other hand, it is really a difficult one to access them easily and require proper solutions for handling unwanted issues. An elevator is mainly meant for reaching a floor as soon as possible. It helps to transport people and goods with high-level protection. Individual homeowners, builders, and construction companies must focus more on important things while installing a new elevator. The first thing is that they have to find a reputed supplier or manufacturer in the markets for making their investments a valuable one. 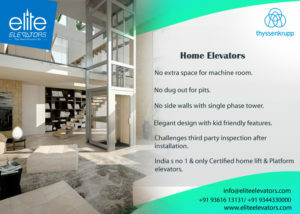 Elite Elevators In India offer all types of lift models for residential applications with the latest technologies. In fact, the company has a good reputation among customers which provides elevators manufactured by ThyssenKrupp. The technologies are improving at rapid levels over the recent years and modern elevators come with most advanced applications. 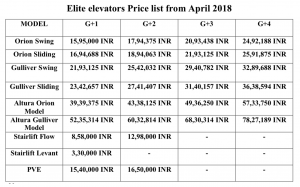 Elite offers elevator systems with simple technology and designs thereby showing ways for gaining more advantages.The technologies are improving at rapid levels over the recent years and modern elevators come with most advanced applications. Elite offers elevator systems with simple technology and designs thereby showing ways for gaining more advantages. Cog belt elevator is the new one allowing the building owners to operate the same without a mechanical system. Altura, HE6, and HE7 cog belt series are some brands available from the company to ensure smooth operations without noises. A hydraulic elevator is a perfect choice for low to mid-sized apartments that can help to meet exact needs in the transportation process. 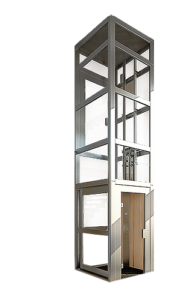 Orion, Gulliver, and Elegance Home Lift are the products of Elite Elevators that suit a wide range of homes. A stair lift is a suitable one for people who are having health issues, mobility problems and physical disabilities. The chair lift offered by the Elite Company is mainly meant for those who use a wheelchair in their home. Flow II, Levant, and Supra are some stair lift models are available for homes to operate them without any difficulties. Anyone who wants to know more about the installation and other costs can contact the company by email or phone.